By Craig | March 19, 2019 | This post may contain affiliate links, which means we may receive a small commission, at no cost to you, if you make a purchase through a link. Read our Disclosure. Can you believe Easter is almost upon us? Where has the beginning of 2017 gone, didn’t we just have Christmas?! “What do we want? Chocolate! When do we want it, now! All around Australia kids are getting excited about Easter Egg hunts, participating in their schools Easter bonnet parade or attending the Sydney Royal Easter Show. For us Aussies, Easter is also the first school holidays since the Christmas break and a time we like to travel and getaway over the long weekend with our families and enjoy the last warm days before winter arrives. 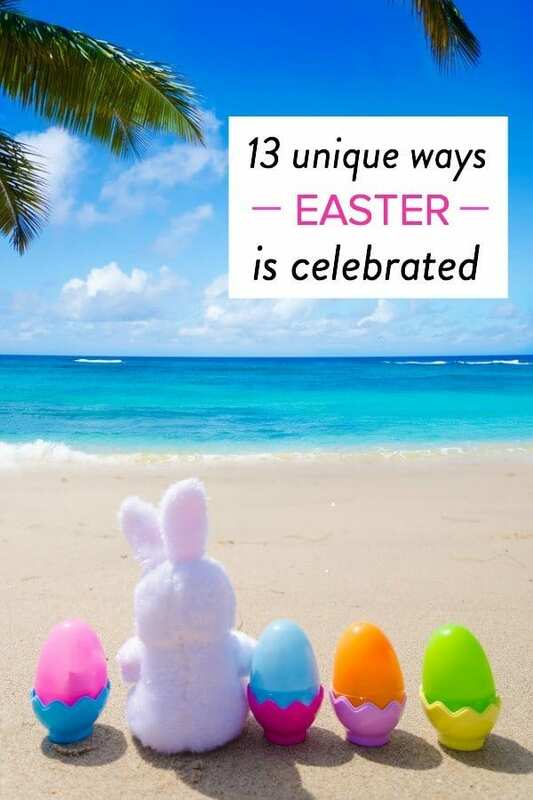 While this may be the norm in Australia, Easter is celebrated around the world in a surprising variety of ways, with traditions different from country to country according to their ethnic and cultural origins. Check out these 13 Easter traditions from around the globe and the history behind them. “Sprinkling” is a popular Hungarian Easter Monday tradition, in which boys playfully sprinkle perfume, cologne or water over a young woman’s head, and ask for a kiss. People used to believe that water had a cleaning, healing and fertility-inducing effect. Besides being crazy football fans, there’s a crazy tradition of creating straw dolls to represent Judas (the apostle known for betraying Christ) and hanging them in the streets and beating them up. And many times politicians involved in scandals become Judas. But, it’s not all aggression, and on Easter Saturday, called ‘Sábado de Aleluia,’ inspires mini versions of Carnaval in many small towns to celebrate the end of Lent. 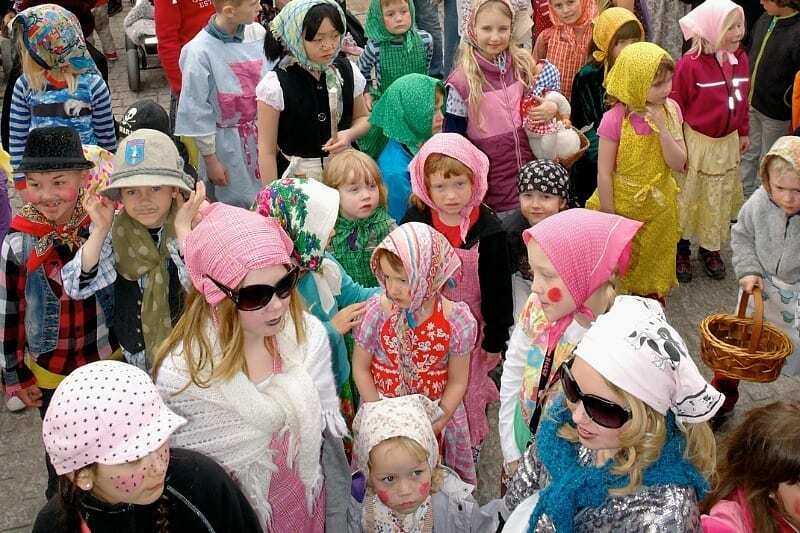 Easter in Sweden sounds a lot like Halloween to me, with the children dressing up as Easter witches wearing long skirts, colourful headscarves and painted red cheeks, and go from home to home in their neighborhoods trading paintings and drawings in the hope of receiving sweets. The traditional of “Pot Throwing” takes place on the morning of Holy Saturday. People throw pots, pans and other earthenware out of their windows, smashing them on the street. Some say the custom of throwing of pots welcomes spring, symbolizing the new crops that will be gathered in new pots. Others say it derives from the Venetians, who on New Year’s Day used to throw out all of their old items. There are around seven million Catholics in Indonesia, Christianity was brought here by Portuguese missionaries, and statues from this time are carried through the streets. Young men consider it an honour to be chosen to play Jesus and be tied to the cross in various locations. On Easter Monday there’s a tradition in which men spank women with handmade whips made of willow and decorated with ribbons. According to legend, the willow is the first tree to bloom in the spring, so the branches are supposed to transfer the tree’s vitality and fertility to the women. This is meant to be playful spanking all in good fun and not to cause pain. 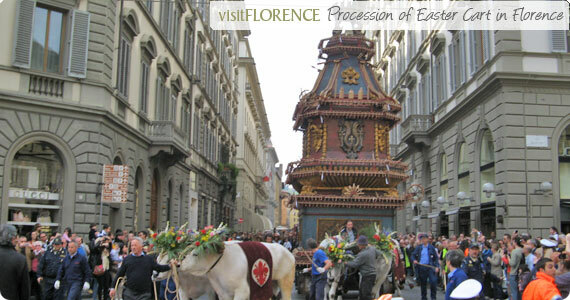 Called Scoppio del Carro (explosion of the cart), this is followed by a parade in medieval costumes. On Good Friday, the locals celebrate by flying homemade kites, eating codfish cakes and hot cross buns. 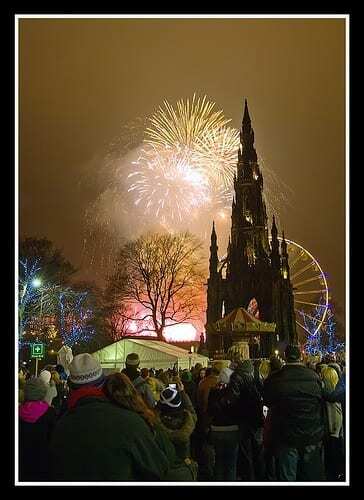 The tradition is said to have begun when a local teacher from the British Army had difficulty explaining Christ’s ascension to Heaven to his Sunday school class. He made a kite, traditionally shaped like a cross, to illustrate the Ascension. 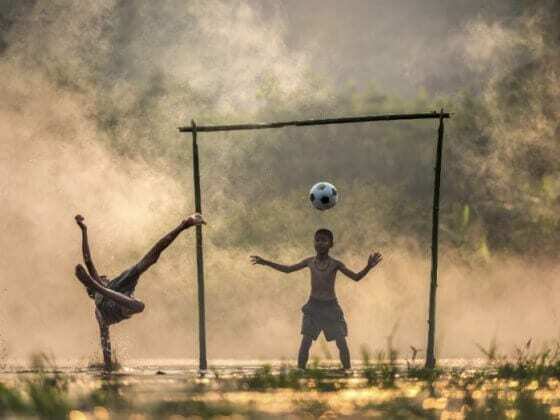 Here people don’t hide their eggs — they have egg fights – and whoever comes out of the game with an unbroken egg is the winner and assumed to be the most successful member of the family in the coming year. In another tradition, the oldest woman in the family rubs the faces of the children with the first red egg she has colored, symbolizing her wish that they have rosy cheeks, health and strength. 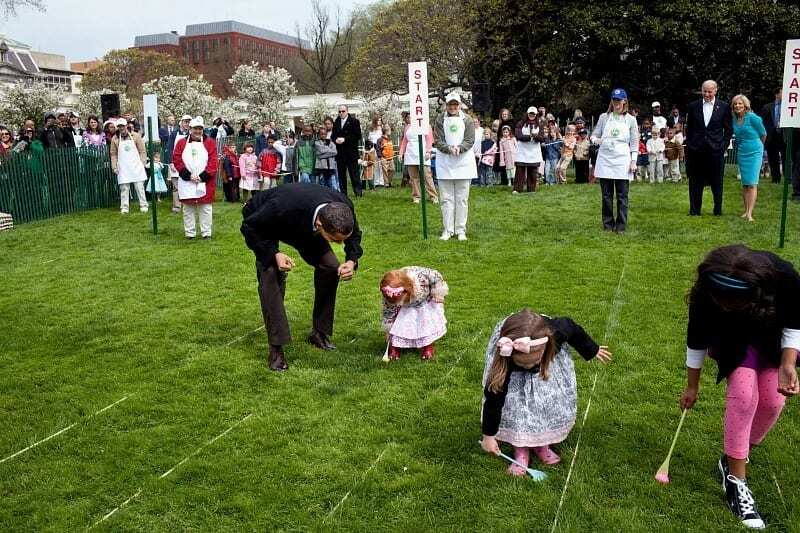 And of course in the United States, the President hosts the annual Easter Egg Roll on the White House lawn on Easter Monday. The tradition, believed to date back to the early 19th century, involves children rolling a colored hard-boiled egg with a large serving spoon. Read More: 53 free or cheap things to do in Washington D.C. This Easter, we’ll be spending it with friends in Utah! We haven’t decided what we’re doing yet to celebrate, but we’re hoping that we’ve found a place to live so the Easter Bunny can hide some eggs in the back garden! You can read more about our road trip across the USA here. Be sure to follow the journey on our Instagram and YouTube. Pop your name in the form below to join our free VIP travel tribe and not miss our personal updates and helpful travel posts. Do you know of any Easter rituals around the world? Are you planning a long weekend break with your family? Great list! I studied in Prague and remember thinking how unique the Czech Easter traditions were! The Easter markets there are great, too. So many beautiful painted eggs! Cool. Would love to take our kids to one of the Easter markets in Europe! Fantastic post! I would love to take the kids and visit different countries at Easter time! Same here Kat, especially in Europe! Craigo!…. It’s another craigo here and I am the bloke who is going to welcome you tomorrow when to arrive at Charleville at the awesome evening star resort on the Adavale road, give me a buzz when you get close to town ( on 0429054600) or email so I can catch up and say g’day to can, the children and yourself,,,,, get ready to kick back in the mulga lands of sw QLD!! Thanks, I completely read this blog, This is very interesting destinations, i like very much. Thanks for including my home country Bulgaria :). It is exactly as you wrote it and it is a strong tradition that is very popular. We also colour the eggs before that in different colours. It was interesting for me to read about how the other countries celebrate Easter. That’s a long time to keep an egg! I bet it would smell horrible. Interesting list. Think I’d like the Bermuda celebration the most, sounds quite and cozy enough. Of course, I wouldn’t pass on rolling an egg with the president either. I wouldn’t want to be walking on the streets in Greece when the pots and pans start flying out windows. You know, i’m from Brasil, and i never heard about Judas straw dolls… Brasil is really big, and maybe is a local tradicion only, not from all Brasil. Here where i live, south Brasil, we hide chocolate eggs for children to find, and celebrate with the family with plenty of food and chocolate. Oh ok, I read about it in several places. But like you say, Brasil is massive. Happy Easter! Haha que absurdo isso! haha eu sou de SP e também nunca ouvi falar nesse tipo de celebracao! E ainda sobre fazer um “mini versions of carnaval”? Onde gente?? could please expand it to include more countries across all seven continents? Thanks, Awesome Information About all Famous Destinations. We have just been through Austria with all the wnderful painted eggs on trees in the towns. Even the shops had glorious displays. Puts us Aussies to shame in some ways! Isn’t it great that each country does something a little differently form the next! Great Collection, All are Attractive Destinations for Traveling. I want to visit Italy, Brazil and Spain with My Family. This was truly a lot of help. We where putting together a program for the Soldiers and wanted to recognize all the ways Easter is celebrated around the world..
It’s so interesting to read about the different Easter traditions around the world! I guess countries from Eastern Europe are quite similar. The “sprinkling” tradition in Hungary and the “egg fight” in Bulgaria also happen in Romania. The Sweden tradition is the same as the Finnish tradition.